While Baby’s Firsts is an app for new parents, what goes on behind the scenes is far more complex. As developers were creating the Baby’s Firsts app, they needed a storage solution that included enough space to store all the high-resolution photos that parents were taking and the customized pages they were creating, as well as a way to accurately move those photos and pages from the cloud to the printer. Initially the team thought that they would have to spend time developing a specialized app internally that would enable them to manage the different image transformations and reapply them correctly in the book creation process. But one of the developers had experience with Cloudinary, a comprehensive cloud-based image management solution, which solved Baby’s Firsts storage and image transformation challenges in a single solution. Since its launch in October 2014, there have been 105,000 downloads of the Baby’s Firsts app. More than 80,000 profiles have been created, and on a weekly basis, there are approximately 8,000 unique users, who are highly active, averaging about eight photo uploads per week. “Our users are thrilled with the app’s ease of use, the seamlessness of the process, and relieved to have a solution that saves time and reduces ‘baby book guilt’” Bridges said. And at the heart of this success is Cloudinary. Cloudinary enables Baby’s Firsts to upload any image type from just a few images, to millions a day, through a variety of means – API, interactive manual uploads and customizable widgets that can be embedded into websites and apps – to its highly available, redundant, cloud-based persistent storage, with revision tracking and automatic back up. Cloudinary also supports processing of image manipulations and transformations on every device and at every resolution, without requiring local software installation or ongoing maintenance. For Baby’s First's, once the app is downloaded and a profile is created, users upload photos of their child to the app, which pushes the high-resolution images to Cloudinary for storage. 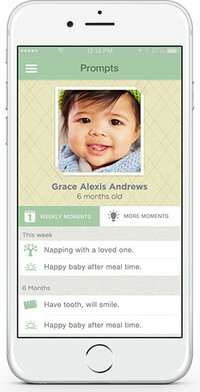 Baby’s Firsts then shows users a “moment tile”, a low-resolution version of the photo, which they can manipulate through Cloudinary’s cloud-based service, within a customized designed frame, which is then mapped to a book page. By serving up screen-sized images to the app, Baby’s Firsts minimizes the bandwidth it requires, making it quicker to access photos and create the baby book pages. 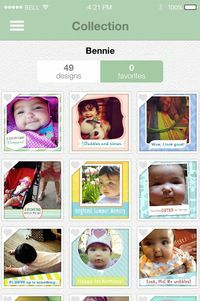 Cloudinary enables users to rotate, scale and crop photos within the frames and then saves transformed images as a unique URL for each page of the baby book. Every time that page is rendered, the image will appear just as the user saved it. Are you using Cloudinary and would like to share your story? Let us know! We would be happy to tell our readers about it.